I had such a fun day on Saturday! Shelter Manager Jen Kaser asked volunteer Randy and me if we’d meet another Wings of Rescue plane at Hillsboro Airport. 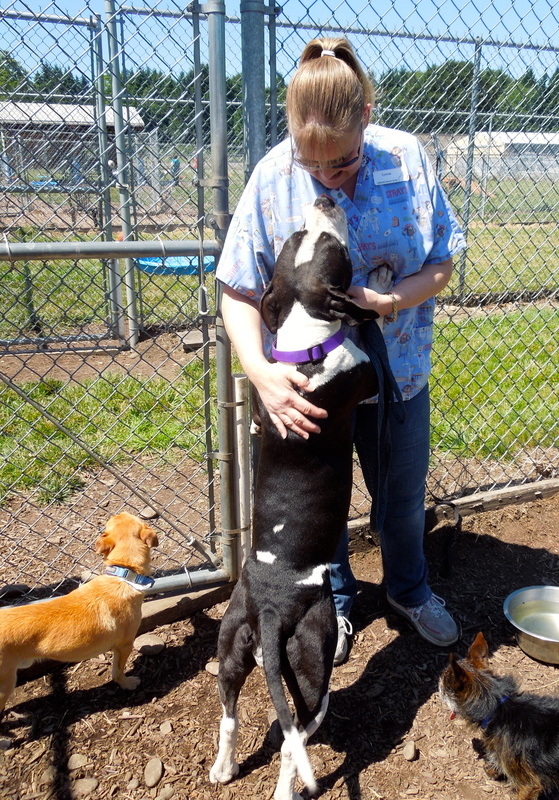 They were bringing us six new dogs from an overcrowded shelter in California. It was a beautiful day and Randy and I thoroughly enjoyed the thrill of being part of saving six precious lives. Here is the story of our day. 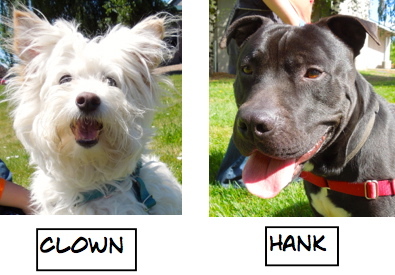 We had several Blog Dog adoptions during the past week. 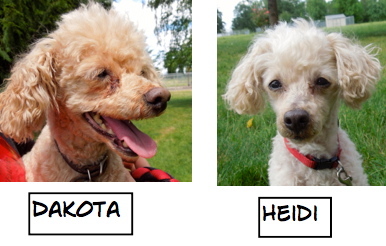 I was especially excited about Hank, Dakota, and Heidi! Play group was great with lots of chatter. 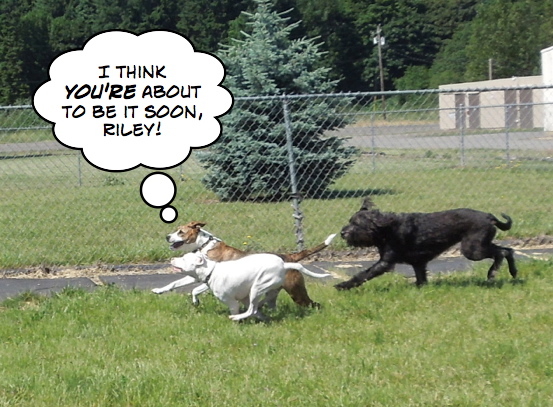 Riley absolutely loves playing chase and wasn’t at all intimidated by Mufasa’s size. 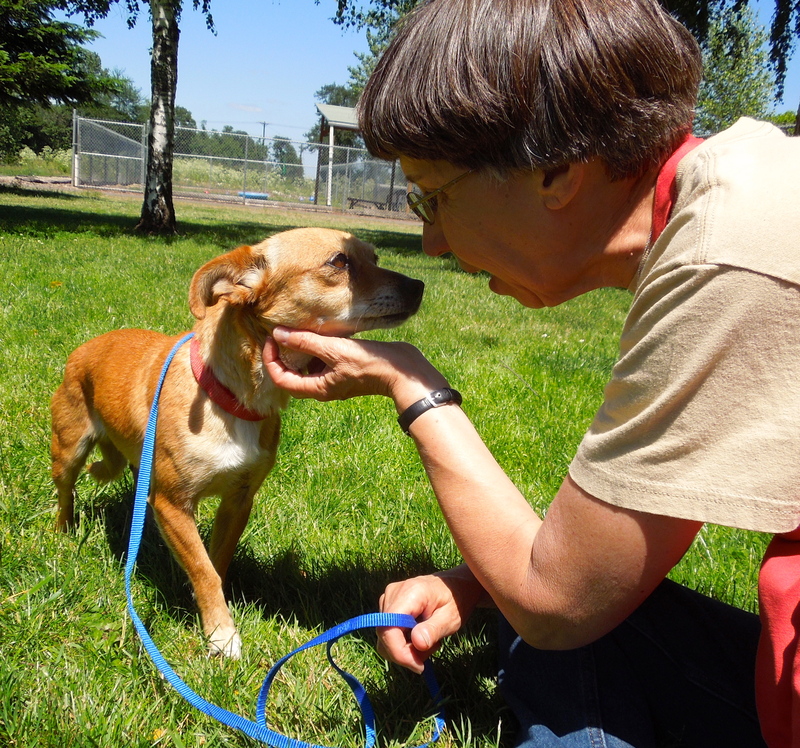 The new Wings of Rescue dogs were still getting used to Oregon. Mia was the “mother hen” of the Wings dogs. 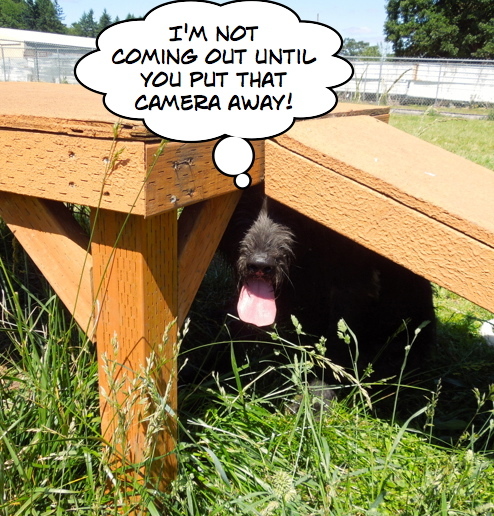 When we were ready to head back into the kennels, Amari didn’t immediately come when I called her. To my amazement, Mia trotted out to round her up! I had quite a few newbies to photograph this week. 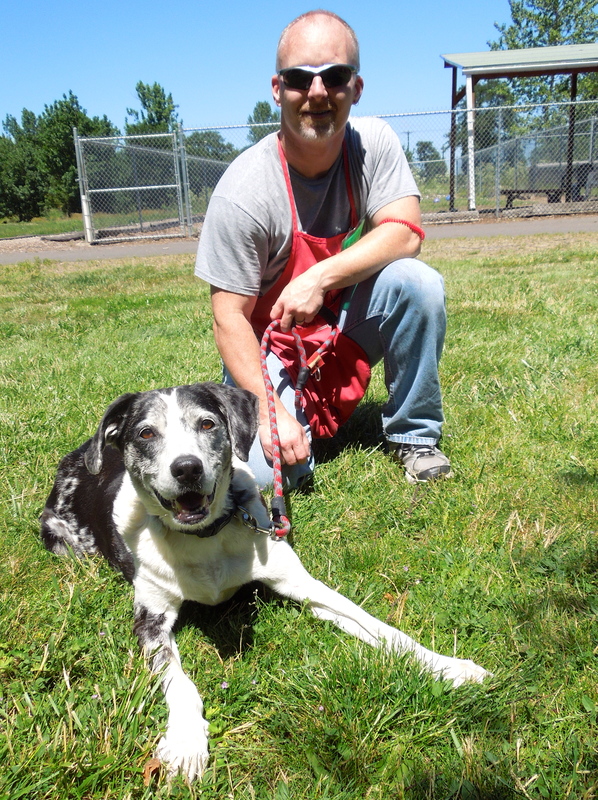 WHS dog walkers are always so willing to pose with our dogs, something I very much appreciate! After Randy and I returned from our Wings of Rescue trip on Saturday, I snapped pictures of two new pups who had arrived from S.T.A.R.T. I’m a five-month-old bundle of fun! This is Rainbow, a rescued S.T.A.R.T. puppy who is fascinated by EVERYTHING she sees. 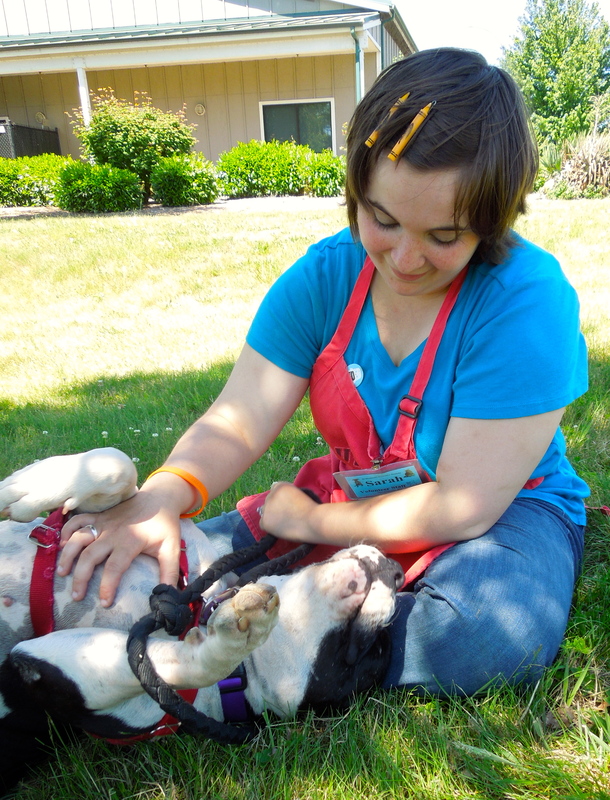 She is a typically active, happy little girl who will thrive in the WHS puppy training classes that come with her adoption. She is a Pit Bull Terrier mix. 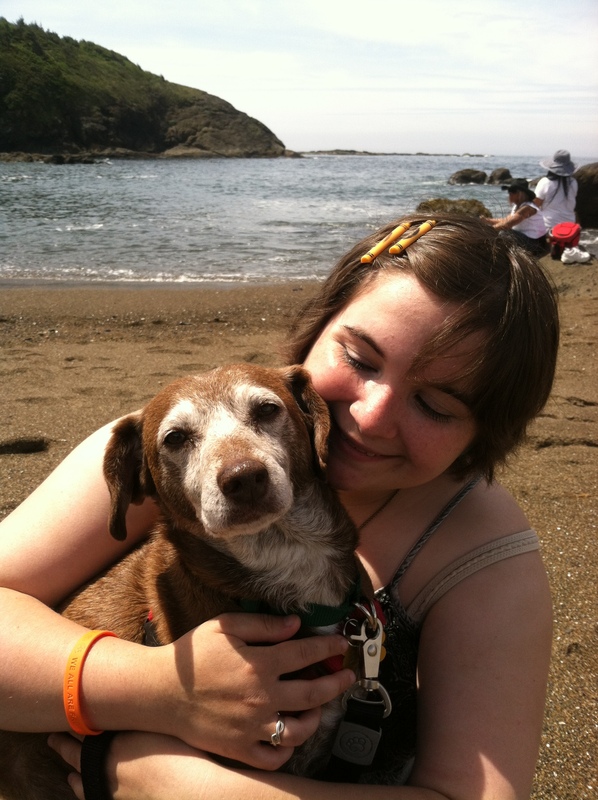 Here she is with volunteer McKenzie. Whatever it is she is looking at is the most exciting thing since sliced bread! Yes, I’m quite relaxed here. Along with Rainbow came Mirabelle, a seven-month-old Pit Bull Terrier who is an absolute clown, as you’ll see in the first two photos. She, too, comes with a great “puppy package” that will help a new owner teach her everything she needs to know to grow into a great family member. 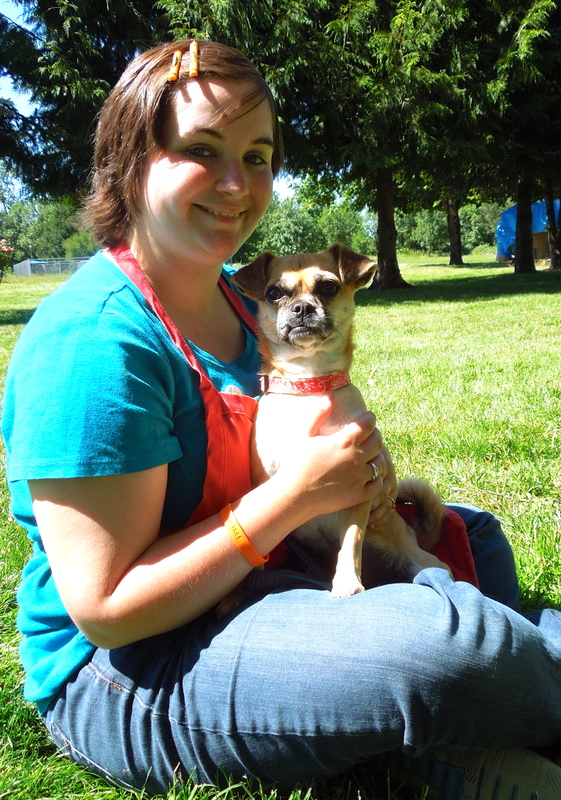 Here she is on Saturday with volunteer Kristy. 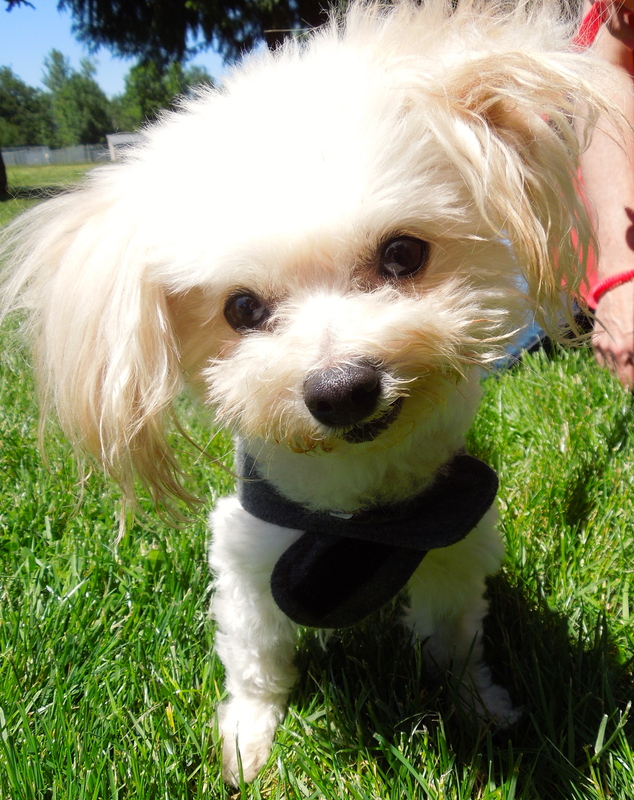 Meet Puppers, a seven-year-old Maltese/Toy Poodle mix. What a little character! He’s pretty much the perfect little guy. 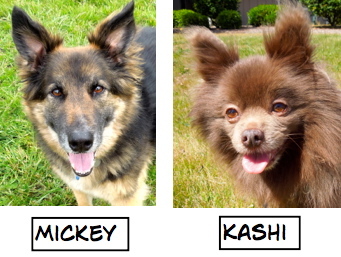 He has lived happily with other dogs and—drum roll—cats! He likes little kids and loves to cuddle. Add to that the cutest expressive face ever! 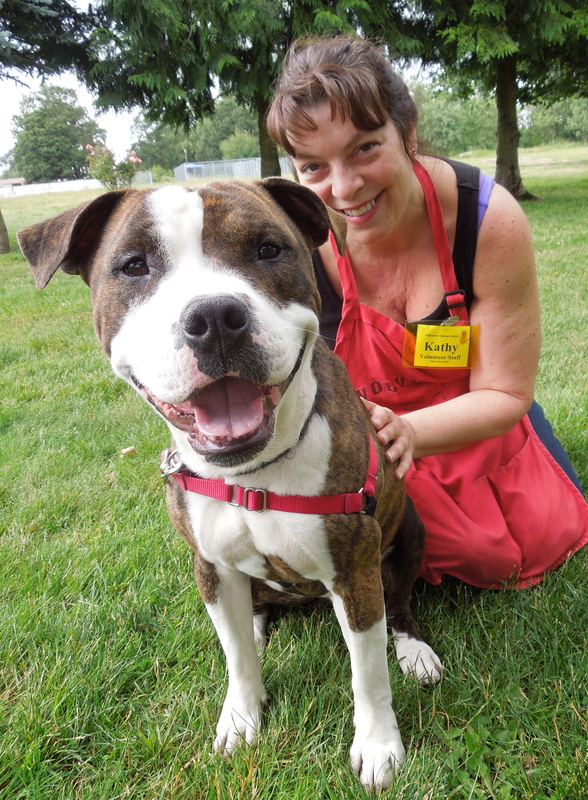 Here he is on Sunday with volunteer Wendy. 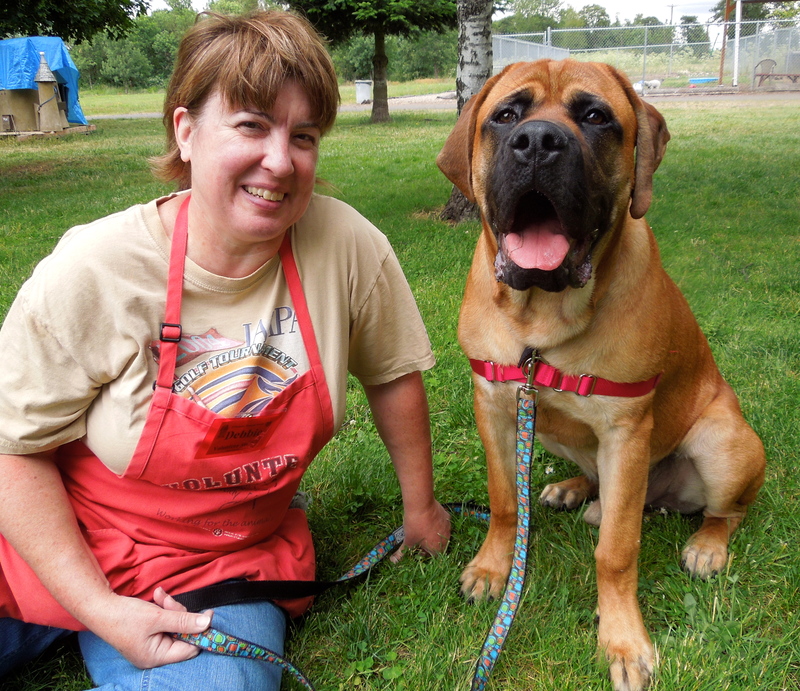 Looking for a BIG, goofy dog? Look no further! 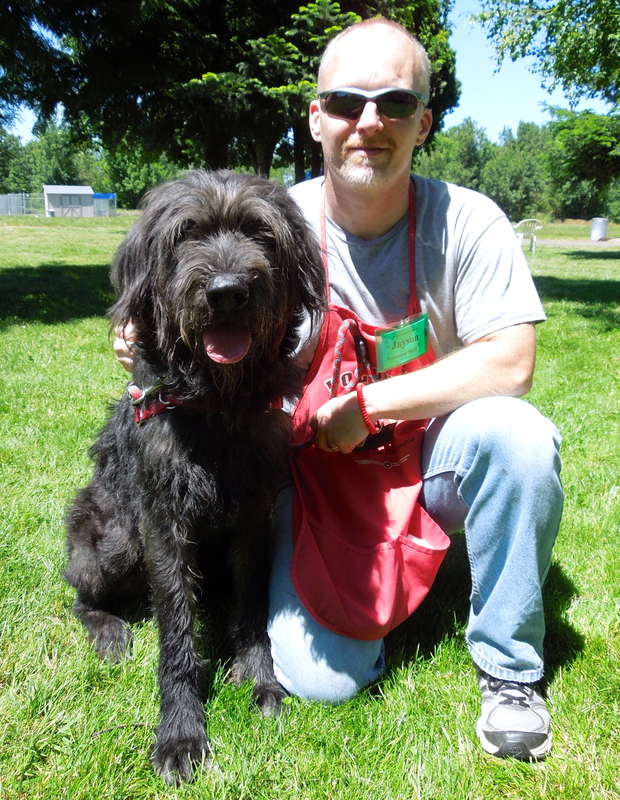 This guy’s name is Mufasa and he is a three-year-old Irish Wolfhound mix. 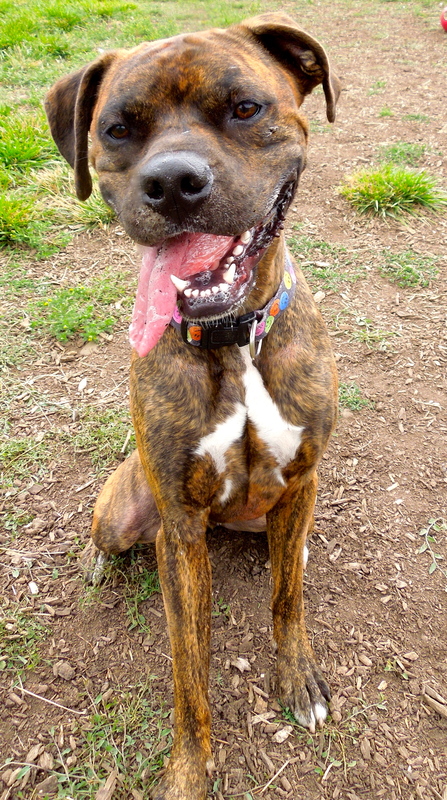 He knows some basic commands, but would love to learn more and comes with a WHS obedience class in his adoption package. 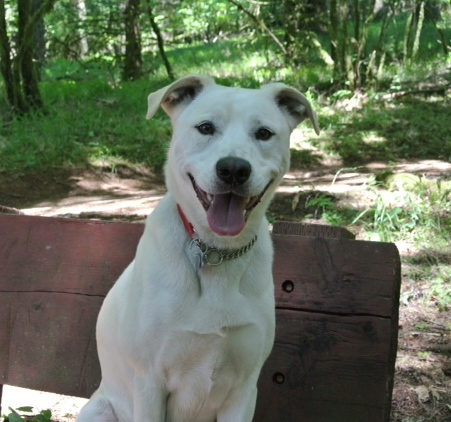 He loved play group and is an active, energetic boy who will need lots of exercise opportunities. He will make a great jogging or hiking partner. Here he is with volunteer Jayson. My name really does fit me. 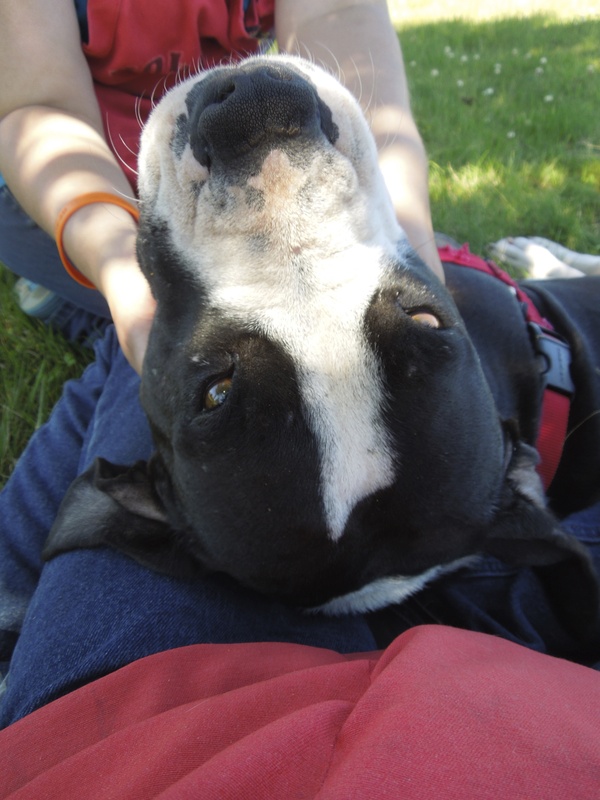 Sarah and I spent some time on Sunday with Love Bug, another rescued S.T.A.R.T. dog who is as sweet as a dog can be. 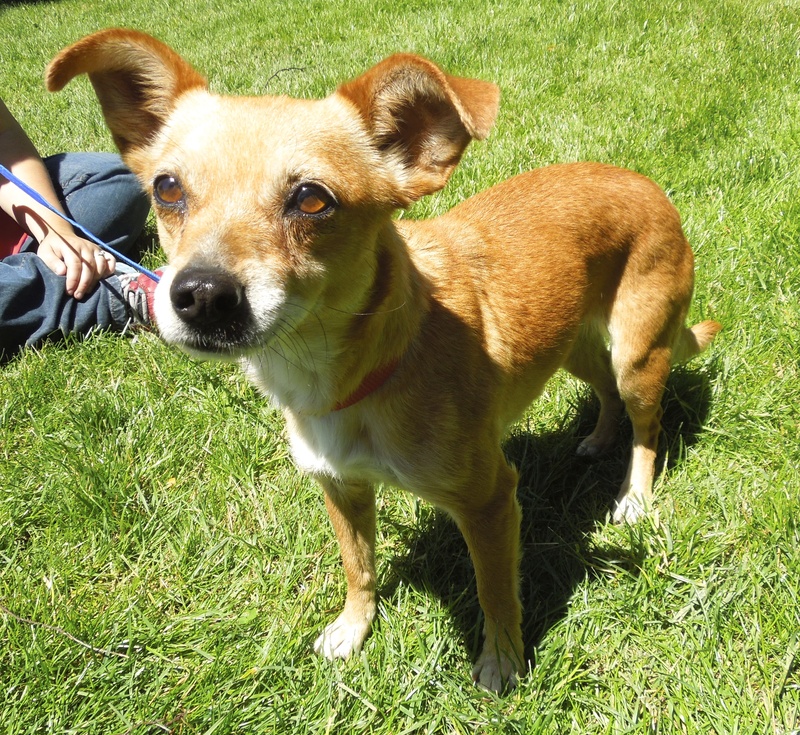 She is a six-year-old Chihuahua who is shy at first meeting, but quick to warm up and crawl into your lap. 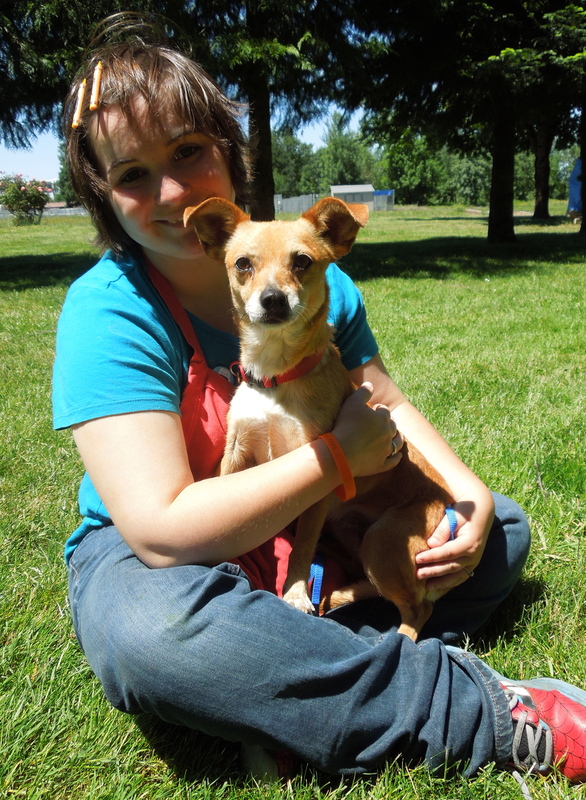 Because she is nervous around new situations, a quiet home with adults or older children will be best for this love bug. We’re hoping she will find her new home very soon so she will feel secure and safe. I’m new, but not exactly. 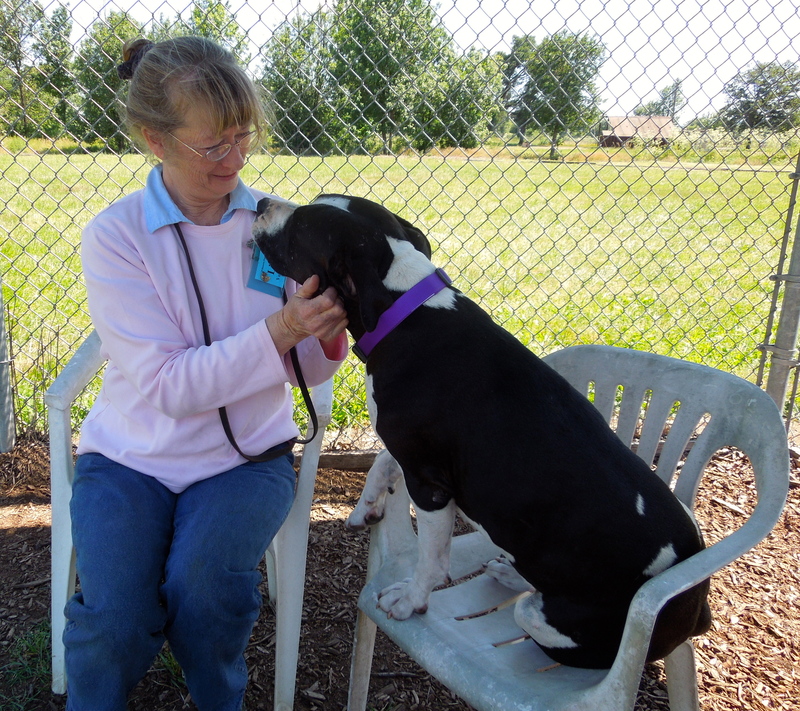 Luna is back at the shelter through no fault of her own. 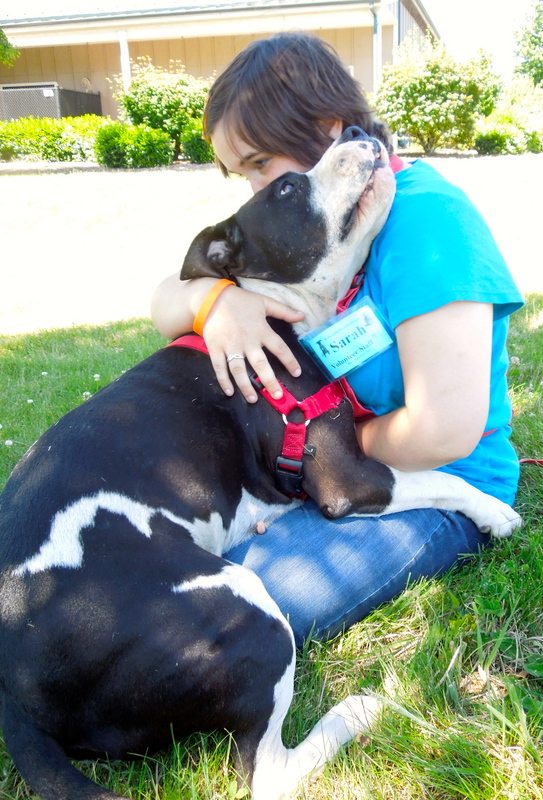 Her family couldn’t keep her any longer and she was returned so she can find a forever home. 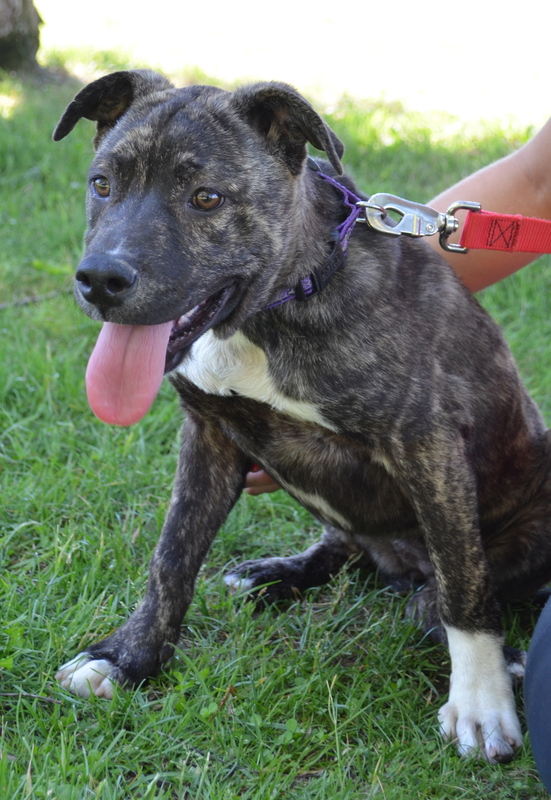 Luna is a four-year-old Pit Bull Terrier mix who is a big girl. 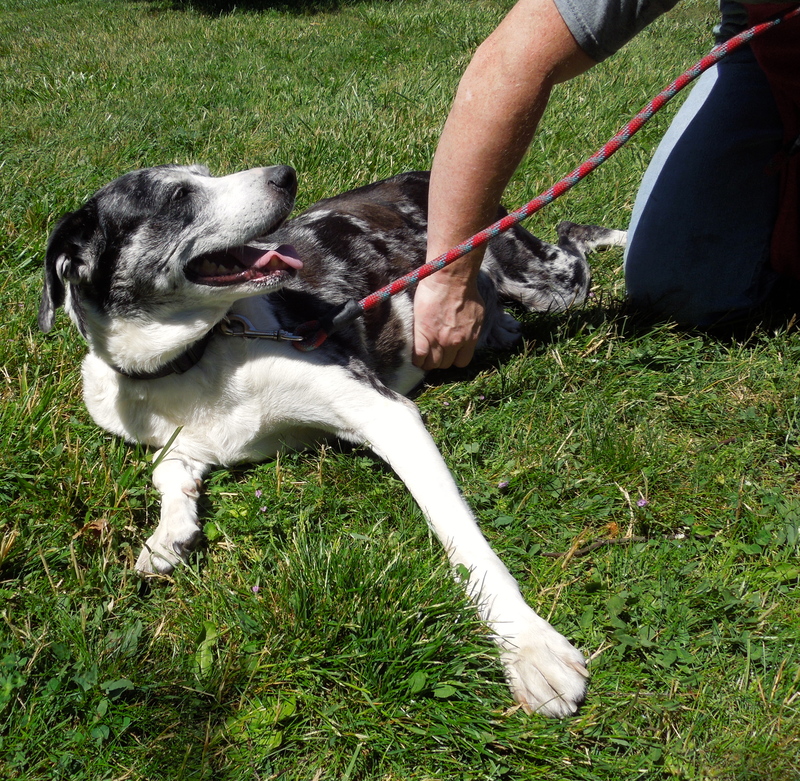 She is affectionate but strong so will need to go to a home with older sturdy kids. She would be a star student in our WHS training classes! Luna needs to go to a home without cats. She would love to be in an active family where she could get exercise and be ready to sack out at their feet at the end of the day. 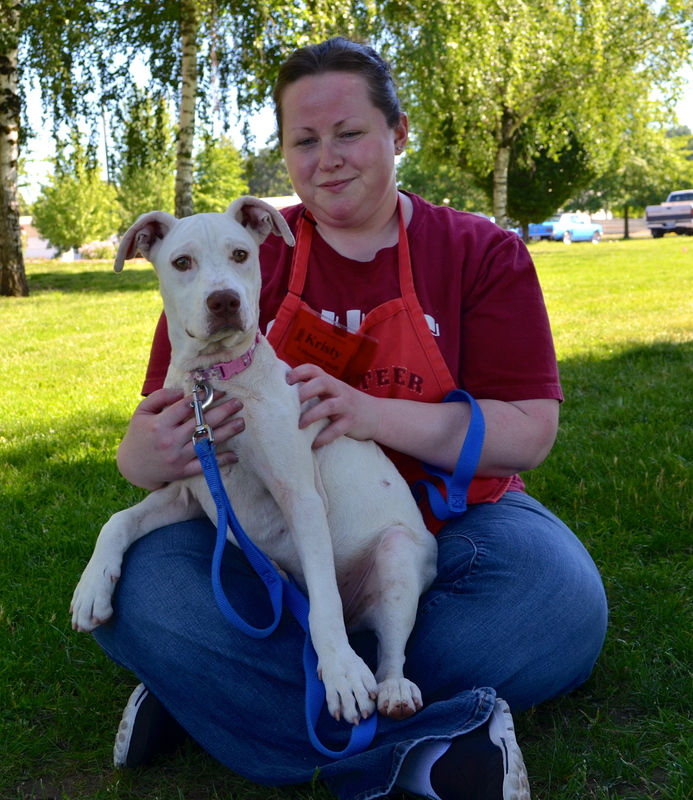 Here she is with volunteer Harley. I love her big head and her sloppy kisses! I can do a cute trick! Wanna see? OK, I have to admit, this pose cracked me up. And it’s not like Miss Kitty does it only once in awhile. She does it every time she thinks you want her to! Miss Kitty is finally out of ISO, she is over her cold, and she feels great. 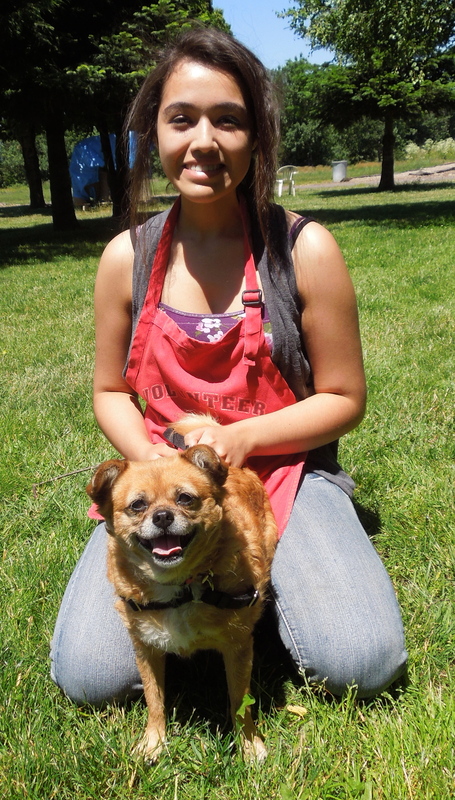 She is a ten-year-old Chihuahua/Pekingese mix who is waiting for a family looking for an easy, low-maintenance new member. She smiles all the time and is just a delightful little girl. 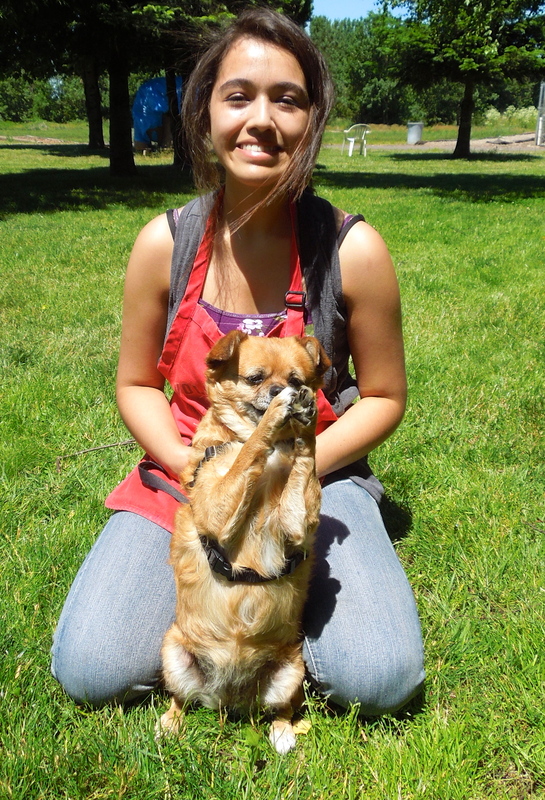 She has volunteer Cindy wrapped around her little paw! Last week wasn’t my week again…maybe next week? 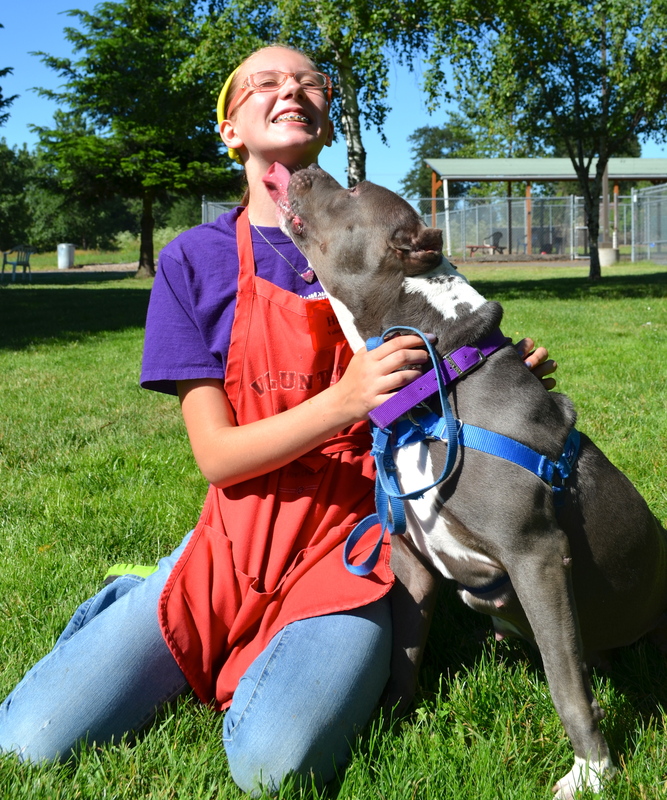 Everyone at the shelter loves Kyra. 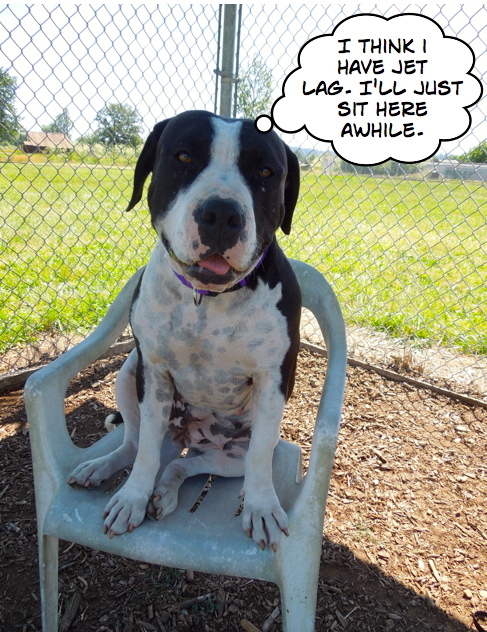 She continues to wait and wait and wait for her new family. She has been waiting since April 8. She loves children, even small ones, ignores cats and although she doesn’t care for every dog she meets (at nine years old, she doesn’t have patience for rude behavior), she could live with a polite canine. Kyra is an Australian Shepherd mix. Here she is with Jayson. She is happy, active, and loves tummy rubs. And she waits. I’m not really as worried as I look. Some dogs just look worried all the time, even if they aren’t. 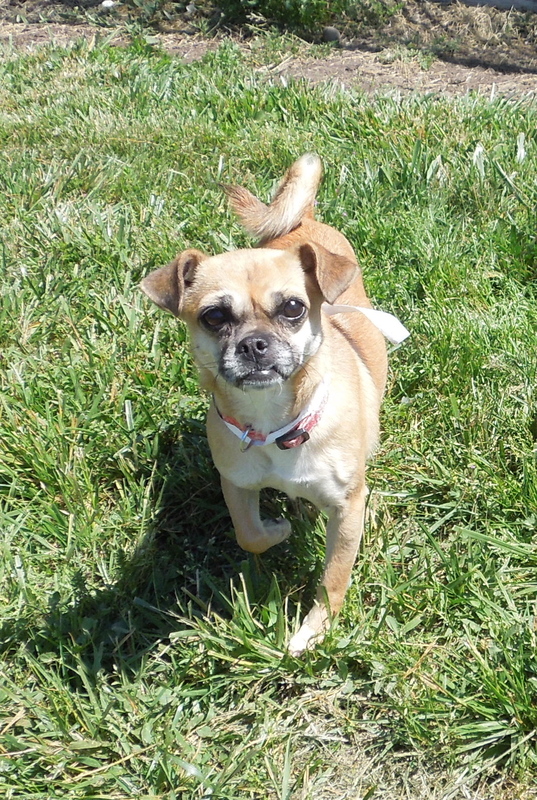 Such is the case with Amari, a three-year-old Pug/Chihuahua mix who came in with the Wings of Rescue dogs. She did great in play group with the whole Wings group on Sunday. And she listened well when Mia reminded her to come when I called her. 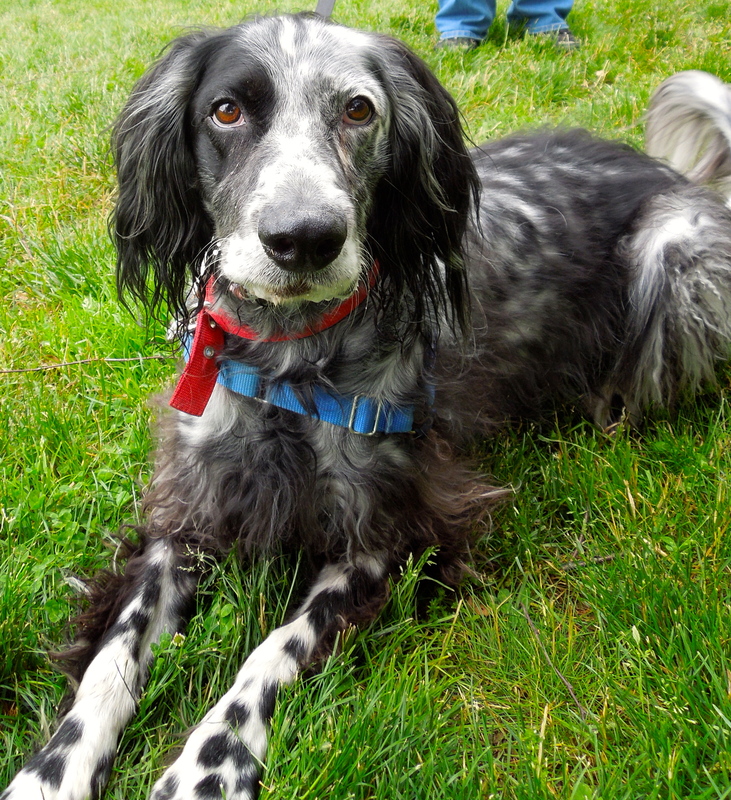 She’s a bit shy when she first meets a person, so would do best in a quiet family with older kids. Sarah fell in love with Amari’s serious little face. She is a sweetheart! Those of you who know me will not be surprised that I have fallen head-over-heals for another wonderful Pit Bull Terrier mix. 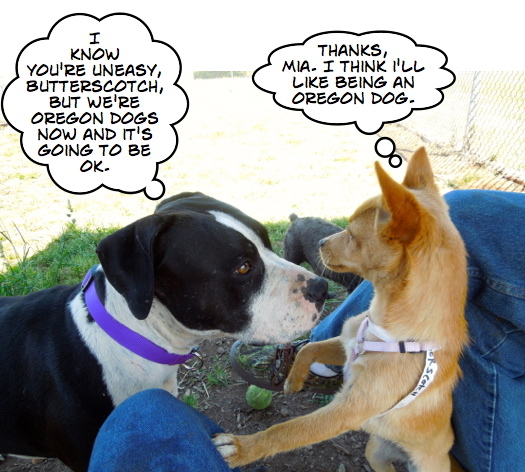 You saw Mia first in the Wings of Rescue movie, then in Chatter. She is simply a very special girl. 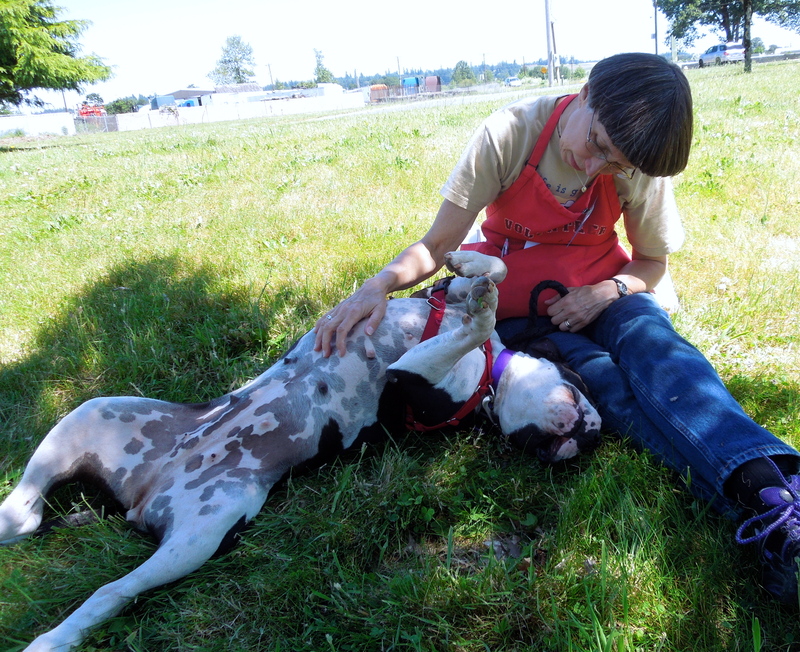 The rescue she came from had wonderful things to say about her from her foster home there. 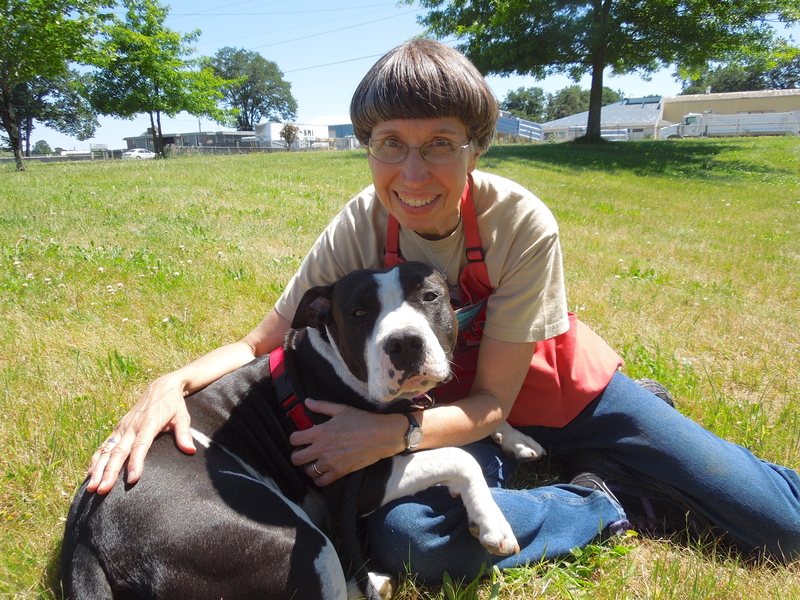 After taking great care of nine puppies (all of which got adopted), Mia lived on a ranch where she was friends with all thirty dogs and staff. When they found out she was flying to WHS, they asked us to PLEASE keep them updated on her. I think the best way for my readers to get a feeling for two-year-old Mia’s amazing personality is the following set of pictures. Talking with Linda during play group. 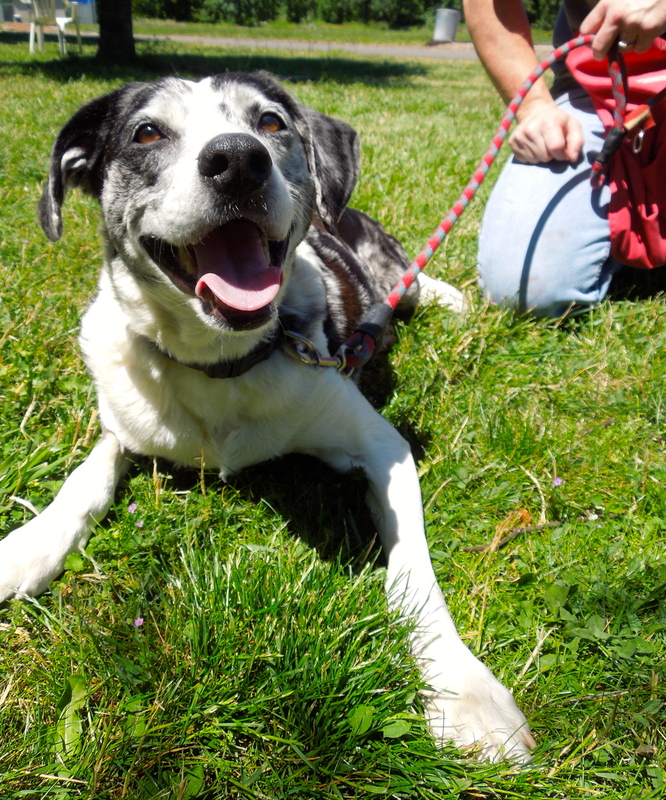 We are all hoping that Mia will find a wonderful forever home soon! I had not planned to add any more dogs to my blog this week, as we had so many to walk today, I didn’t think I’d have time to take any pictures. But after getting everyone out this afternoon, two of my wonderful walkers stayed a little longer so I could introduce three newbies. 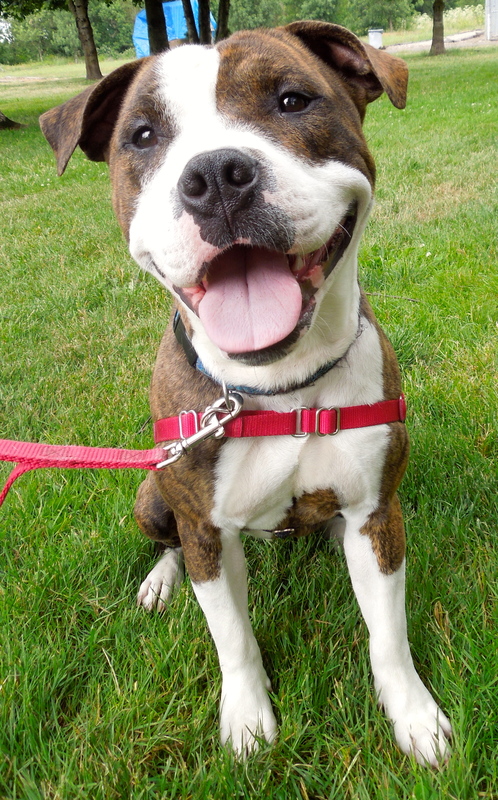 What a great smile on this one-year-old Pit Bull Terrier’s face! 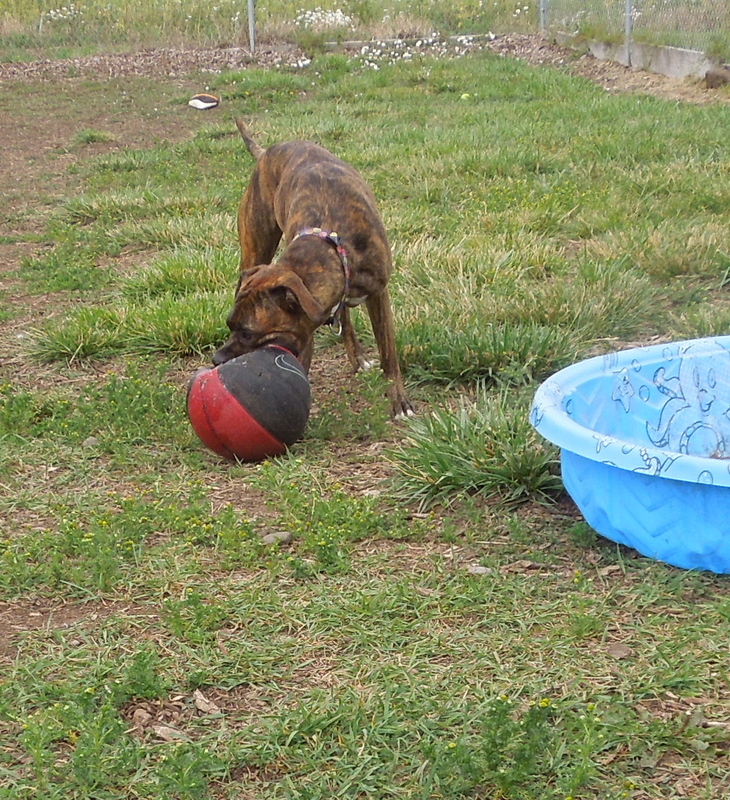 Beefy has lived in an indoor/outdoor environment and needs to work a little on his house-training skills. 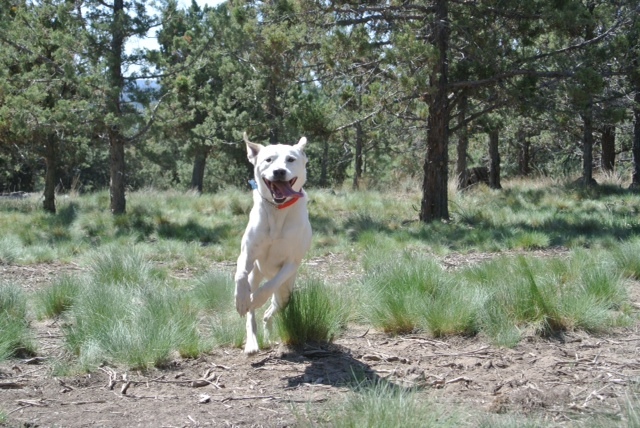 He is full of young-dog energy, so needs to go to a home with older kids. He also needs to meet any other dog with whom he might live to make sure they hit it off. He walks pretty well on leash and knows some commands including sit. 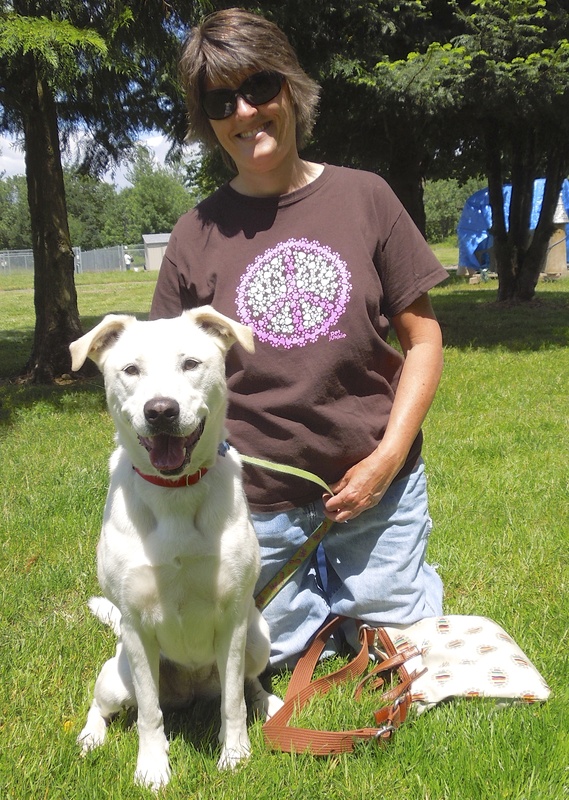 He’s a goofy young adolescent boy looking for an active home. Here he is with Kathy. Are you waiting for a BIG Guy? 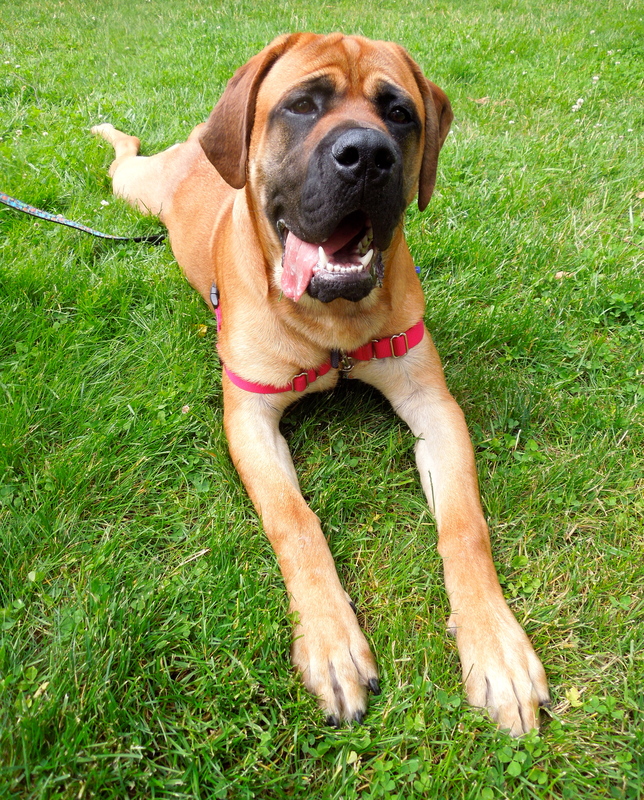 This is Jaxson, an eight-month old Mastiff/Rottweiler mix. Today Debbie and I couldn’t stop laughing at this giant’s antics. He is friendly, eager to please, and totally unaware of his size. He actually tried to sit in Debbie’s lap! 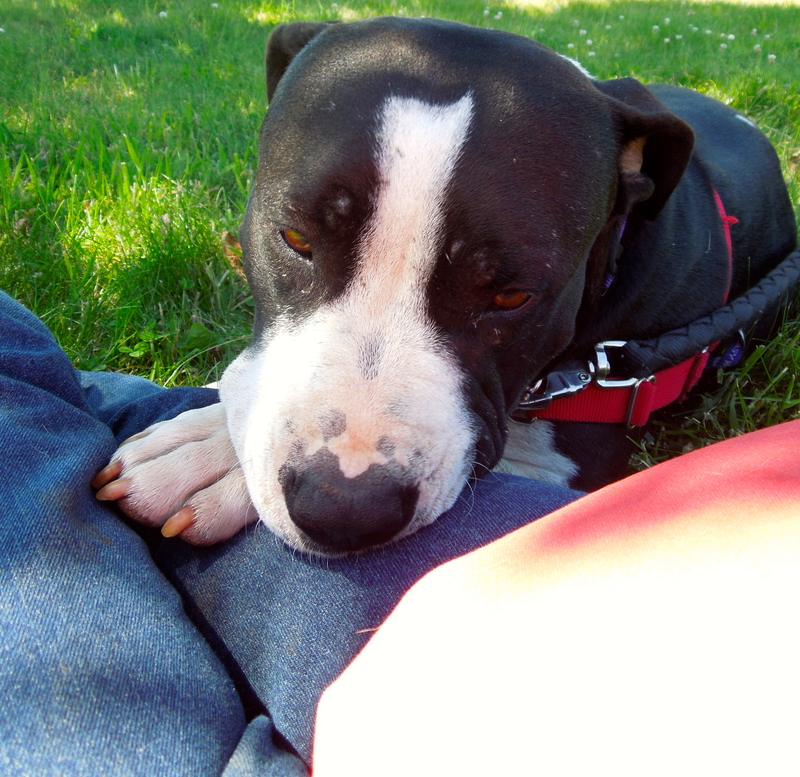 Jaxson has lived with small children and is very gentle with them. 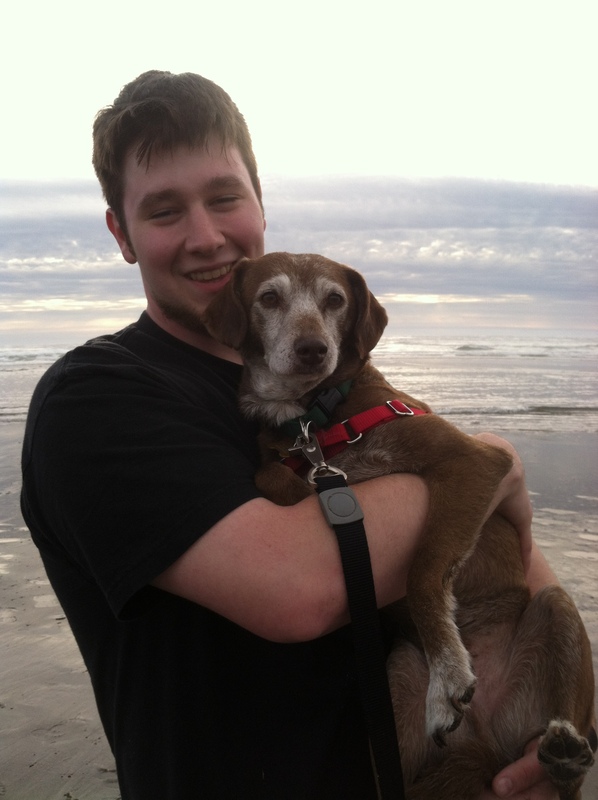 He gets along with other dogs, too, and is house-trained. He’s a super nice boy with a big heart! I’m new here and hoping for a forever family soon! 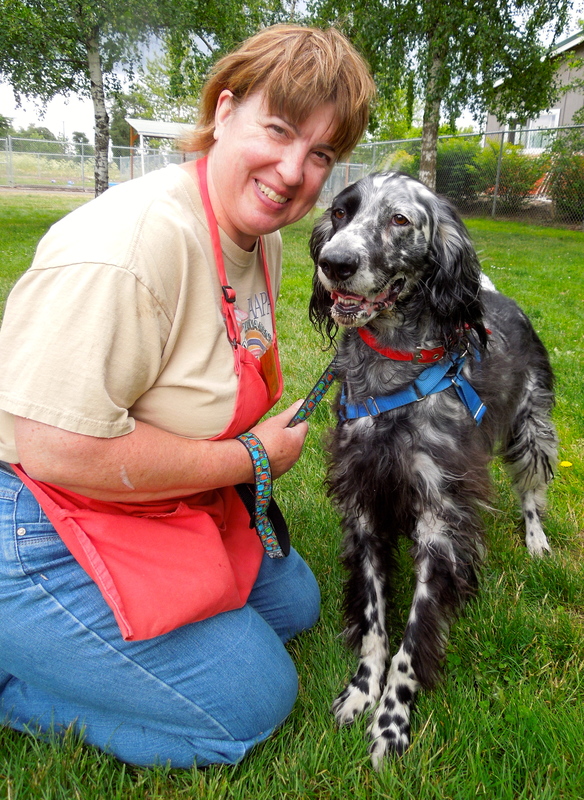 This beautiful dog is Max, a five-year-old purebred English Setter. He is looking for a home with older kids (small ones make him nervous) or adults. He likes other dogs but shouldn’t be around cats. 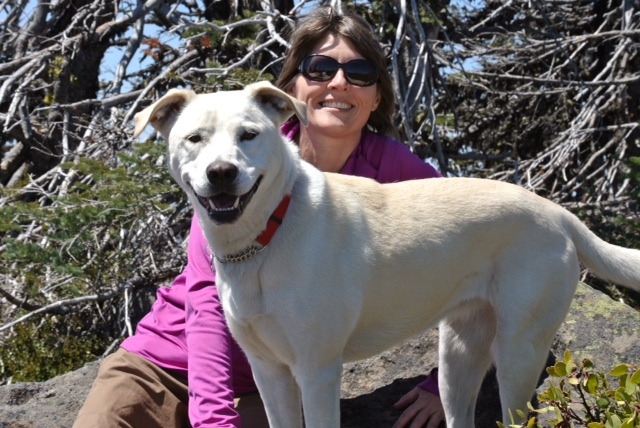 He knows several commands and is a happy, cooperative dog. Here he is today with Debbie. He walked well on leash and took my treats gently. I love the look in his eyes. Of course I spent some quality time with Axel at the end of my shift. We worked on his walking beside other dogs skills by walking with gentle Mia. He did very well and Mia was such a calming influence. 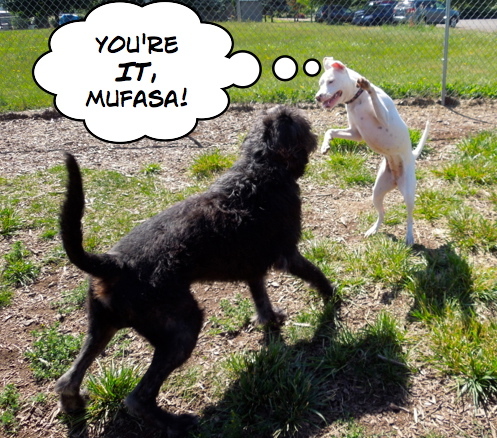 Then we played a rousing game of fetch. 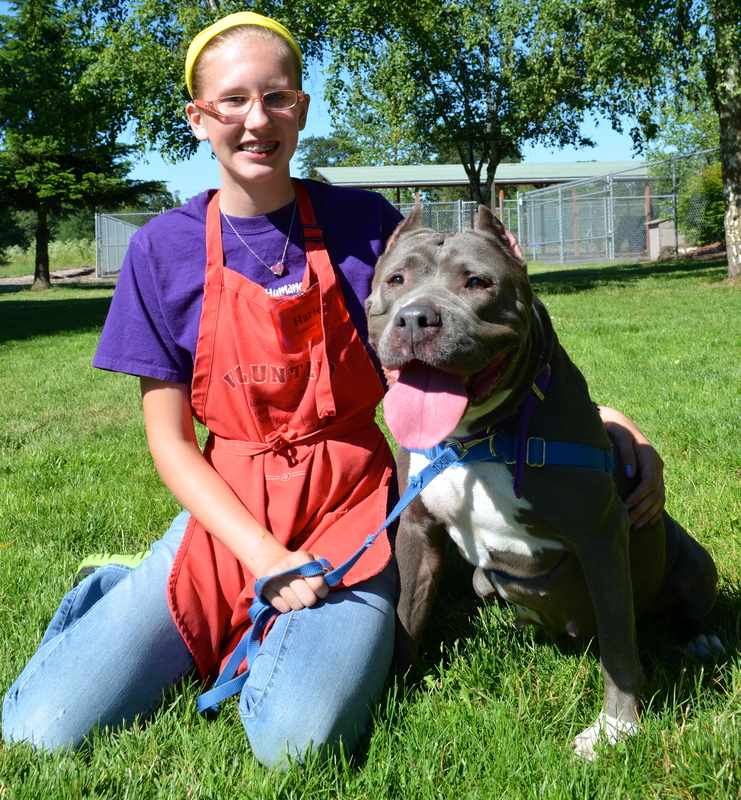 I’m so hoping the right experienced owner will find Axel and give him a great home! He is so worth the effort his training will take! 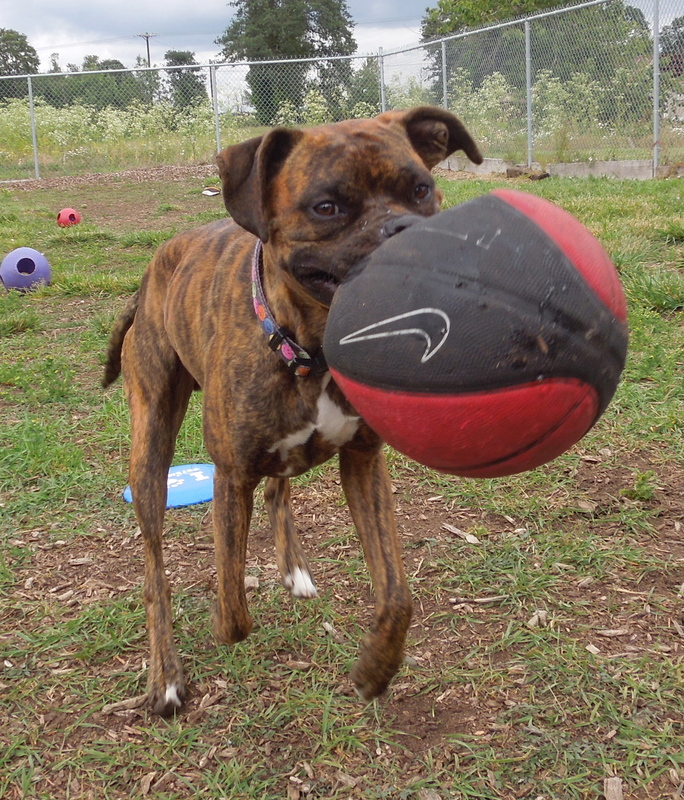 Axel loves a ball of any size…no ball is too big! 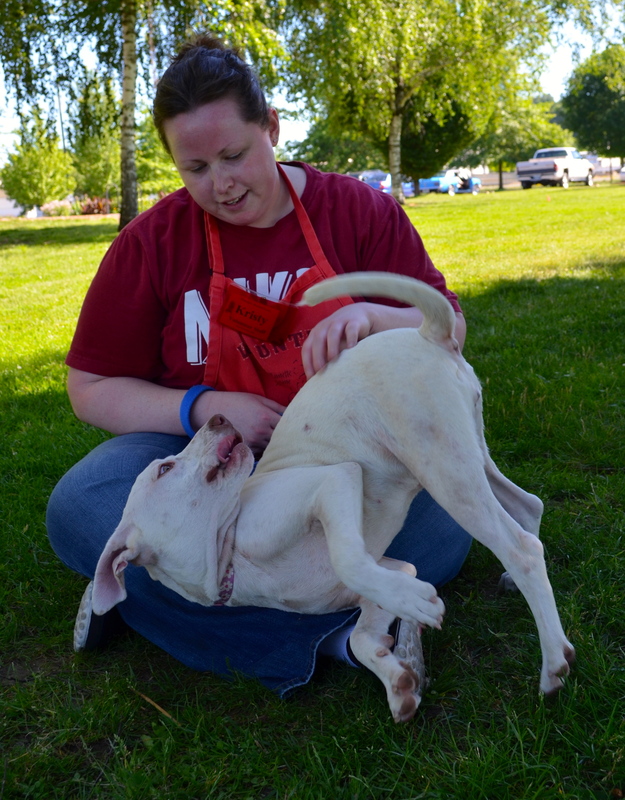 Riley belongs to fellow WHS volunteer Julie and loves to come to play group. Here is the latest about this wonderful girl. Here’s a picture I took of Riley and Julie after play group last week. Julie sent me the rest. What a happy girl! If you are a regular reader of my blog, you know volunteer Sarah well, as she is my terrific photography assistant on Sundays. After she adopted Banjo, now Gimli, I asked for an update. Little did I know that Gimli would want to write it himself! “I met my mom on a Sunday. She is a volunteer at the shelter. 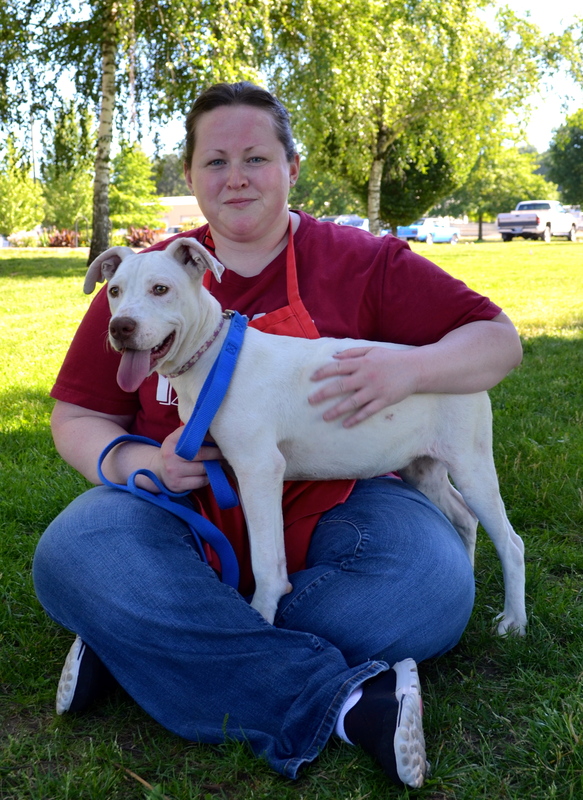 She came into my kennel to meet me and I crawled into her lap. I knew right then I wanted her as my human, but she was in the process of moving and wasn’t quite ready to adopt a dog. But she still spent time with me and we grew to love each other. 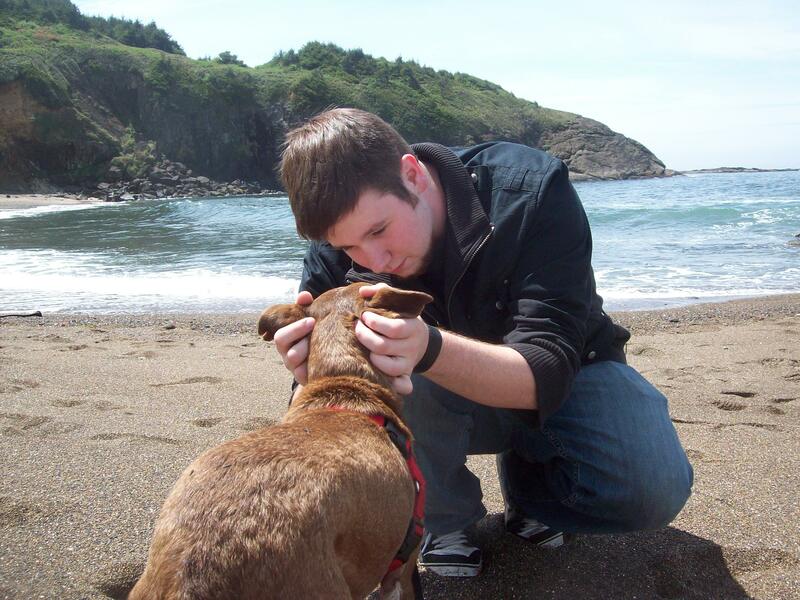 A while later I was adopted by someone else but it didn’t work out and eventually I was brought back to the shelter. When I saw my future mom again I was so happy! I was out for a walk with some other volunteers and my mom was headed home. I wanted to go with her, and I wouldn’t move. 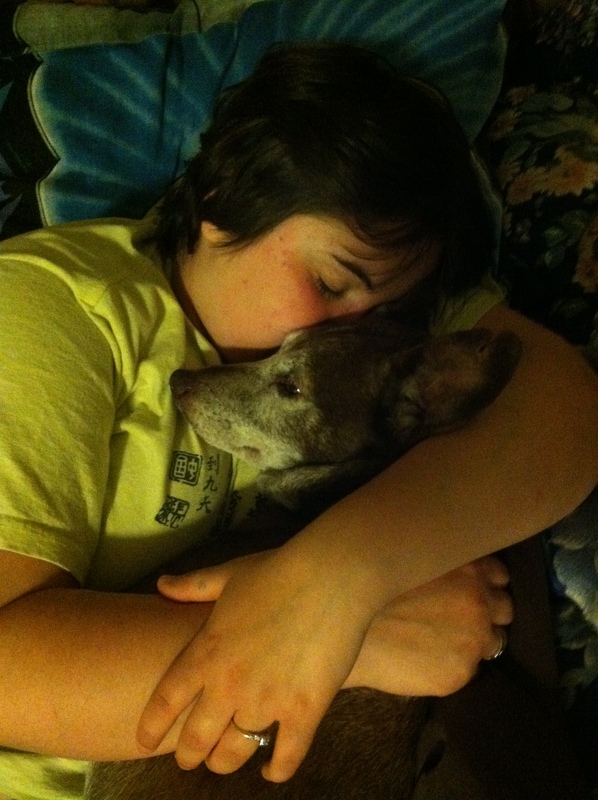 I gazed up at her and told her in no uncertain terms I wanted to be her dog. She had moved and could now have a dog! The next day I met my dad. Now I have my real forever family! I am an elderly gentleman who enjoys the simple things in life: treats, naps in soft places, cuddles with my people, and walks. 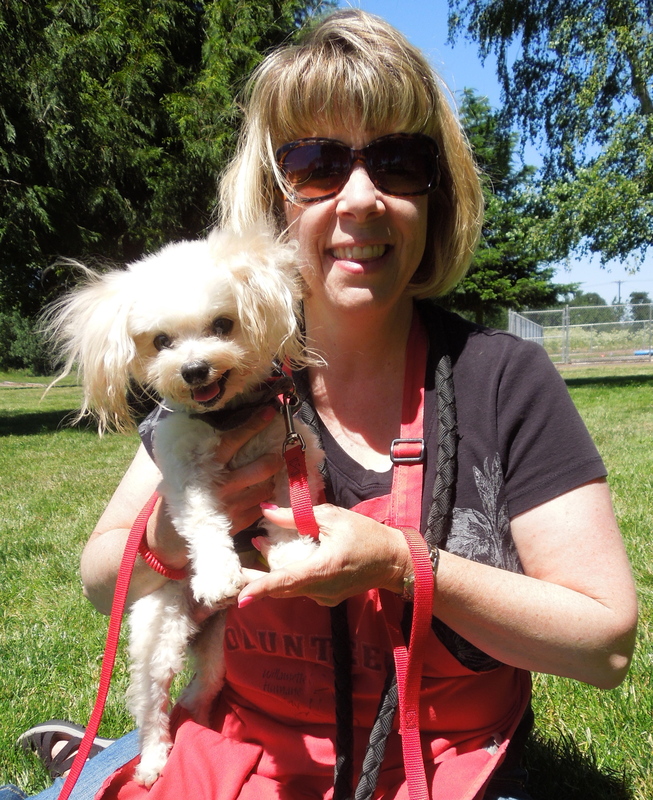 Boy, do I love walking at Minto Brown Park! I go every day with my new mom. I have more toys than I even know what to do with! Mom is trying to get me into Star Trek. (I don’t tell her but I find the show a little boring; I just want to be near her and it’s what she watches.) I much prefer when she reads to me. I like the poetry of Walt Whitman; it soothes me. I also enjoy watching my dad play video games. I have grandparents who love me, too. I go to their house for dinner every Sunday and I am very respectful of the cats who live there. (I am a little scared of a large black one they call Shadow.) At my other grandma’s house I have dog cousins, two Pit Bull Terriers named Rufus and Bliss. They are fun to be around. My life is stable, routine and full of love. I guess its true that timing is everything. Good night, Gimli and see you next week, everyone! I love this one! I usually do but I really enjoyed this one this week!!! Another fantastic blog! 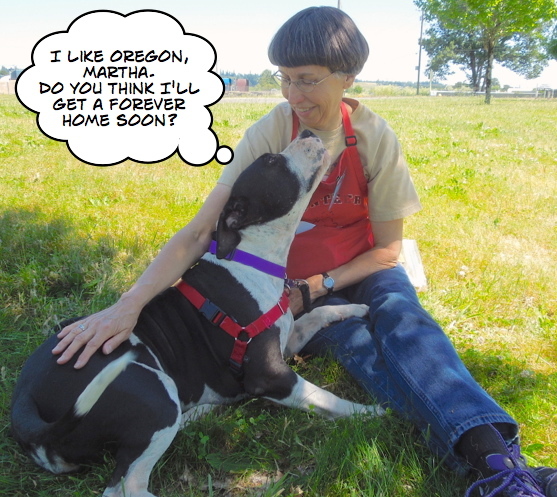 Thanks Martha and all the photogenic volunteers and dogs! Just super! The close ups of those cute dog faces always make me want to just cuddle all those dogs; especially Mia and Pupples (Pupples has the cutest face ever, and you really captured it). Great slideshow and the usual GREAT post! This weeks blog was awesome. Love the Irish Wolfhound mix! Hope he finds a wonderful home soon.